The brief description of photos MI-6. Photo 01 - Aeroflot's Mi-6A Hook (CCCP-21026) crashed near Russkinskaya petrol explorer's base.Tyumen region, mid of 80's. The accident was caused by the main gearbox partial destruction in a few minutes after taking off from Russkinskaya. The crew got enough experience and luck to stay safe in the accident. Photo 02 - 03 - Port side (two shots). Photo 04 - The tree damaged the fuselage skin. The technician who had preferred to fall asleep just after taking off, was thrown on a floor when the copter hit the ground - and so much shocked, seeing the tree through the crack in the fuselage! Photo 05 - Another tree punched the Hook's auxiliary wing. Here we can also see the troubleshooting unit - according to ground crew's reminiscence, there was a big crack in the gearbox's upper lid, about an inch-wide. The destruction of satellite cogs caused the displacement of the bell-cog and the whole rotor axis. Photo 06 - Ground crew man smoking a cigarette with CCCP-21026 in the background. 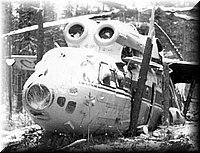 Copter's damages were so serious that no one even thought about her evacuation. Mi-6A was written off and burned down next summer during the forest fire. Photo 07 - Undercarriage legs broke the fuel tank. Photo 08 - 3 days after the accident. CCCP-21026 from the height of 120 m.
Photo 09 - 7 days after the accident. Photo 10 - Preparation to main gear's removal CCCP-21026 was carrying underslung load during the accident. Here we can see it in the foreground - a food container, squeezed and then bear-plundered. Photo 11 - Mi-6A (CCCP-21020). Ground crew is busy replacing again the main gearbox in the swamp not far from Noyabrsk (1977). This Mi-6 is shot after forced landing, caused by tiny metal particles exposed in the oil system.